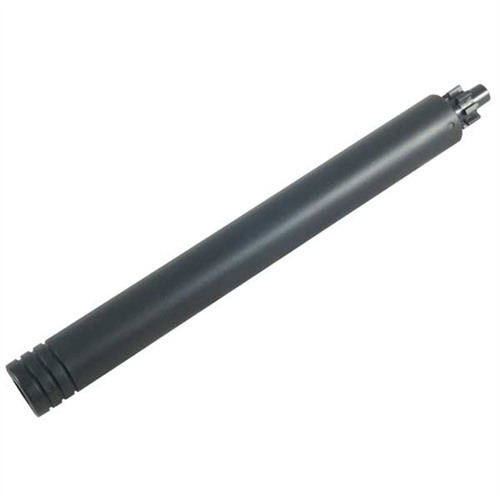 Machined Delrin® bore guide replaces the bolt carrier while integral “locking lugs” keep guide firmly in the receiver. Lets you keep both hands free for better cleaning rod control. Helps keep solvents and other debris out of lower receiver during cleaning. SPECS: Machined Delrin body. 91⁄2" (24.1cm) long. Machined Delrin ® bar guide erstatter bolten carrier mens integrert "låsing lugs" holde guide fast i mottakeren. Kan du holde begge hendene fri for bedre renhold rod kontroll. Bidrar til å holde løsemidler og annet rusk av lavere mottaker under rengjøringen. The locking lug things don't really keep the guide in place because the o-ring doesn't grip the chamber well which is supposed to keep it from spinning. The entrance hole edge was a little sharp and scraped the coating off my cleaning rod. I like the JP Enterprise one better. Do not wast your money. This product was not finished (Sharp edges inside of the tube)Just a cheep made product. Mine was fine. Worked as described. O-ring grips enough it didn't come out until I wanted it to. Insert it; give it a twist and you can add solvent through the solvent port without gunking-up the chamber. Combined with a proper cleaning stand, it's the way to go. Bore Stay Bore Guide Machined Delrin ® bar guide erstatter bolten carrier mens integrert "låsing lugs" holde guide fast i mottakeren. Kan du holde begge hendene fri for bedre renhold rod kontroll. Bidrar til å holde løsemidler og annet rusk av lavere mottaker under rengjøringen.